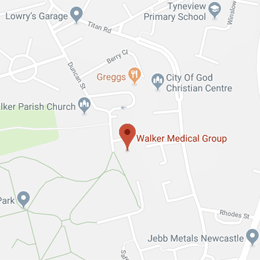 We can trace our practice history back over 90 years and proudly continue to offer high standards of family health care to the population of Walker in our purpose built surgery in the heart of the community. To register with us contact reception and we will arrange a pre-registration health check appointment. We are located right next to Walker Park and Church Walk shopping centre. Download and print registration form. If you want to know more about the surgery have a browse of our website,read our practice leaflet or patient newsletter. If your child has become unwell in the last few days and you would like urgent advice then please contact the surgery and we will arrange for a clinician to speak to you and if necessary to see your child today – this could save you an unnecessary trip to A+E or a Walk-in Centre. Can we also make you aware of the Little Orange Book, which provides expert help for parents and carers on how to manage common problems in babies and small children. Pick up a copy from reception or view online. We always try to be as flexible as possible. We offer late appointments on Monday until 19:30 and early appointments on Tuesday, Wednesday, Thursday and Friday from 07:30. We will always endeavor to give you an appointment at a time that suits you, including the future – just ask. A certain number of appointments are held back to be released daily allowing the opportunity for urgent cases to be seen. Please remember if you can’t attend your appointment cancel it so another patient can use it. If you are unable to get an appointment the pharmacy first scheme may be able to help you. Local pharmacies provides expert advice on common health problems and many pharmacies have early and late opening hours. If you receive free prescriptions you can use the Pharmacy First scheme which allows people to go straight to their pharmacist to receive treatment without needing to get a prescription first. In the surgery by placing request in the white repeat prescriptions box at reception. Stamped addressed envelope sent 1 week before the medication is required. Prescriptions will be ready for collection 48 hours from the start of the next working day.